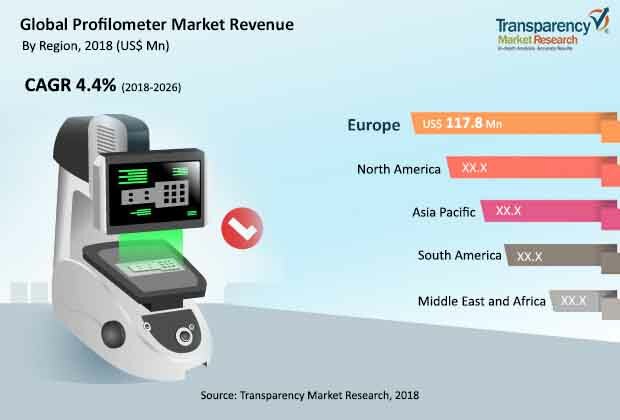 According to a new market report published by Transparency Market Research titled “Profilometer Market – Global Industry Analysis, Size, Share, Growth, Trends, and Forecast, 2018 – 2026,” the global profilometer market is expected to reach US$ 528.47 Mn by 2026, expanding at a CAGR of 4.4% from 2018 to 2026. Europe held the highest share in the profilometer market in 2017. Surface profilometers are devices that help to measure the surface profile in order to quantify the roughness. Factors such as higher usage of 3D non-contact profilometers and demand from electronic, semiconductor, and automotive fields is set to fuel the global profilometer equipment market, consequently resulting in the rising demand for profilometers. Regulations and policies increase the product standard and quality. High investment cost of machinery for setting up production units is expected to hamper the global profilometer market. However, manufacturers of profilometers are more focused on product development and innovating new advance profilometer technology which are expected to create huge opportunity for the profilometer market during the forecast period. Rapid industrialization and focus on rapid growth has resulted in significant dominance of profilometers in 2017. Contact profilometer is preferred due to the accuracy of the data that is received. However, non-contact profilometer is expected to witness the fastest growth due to the advancement in technology such as adoption of visualization tools in order to receive accurate results of the study. Optical methods are expected to witness rapid growth during the forecast period due to the adoption of several advanced techniques which are related to the rising computing capabilities over the years. Optical methods help to derive accurate results even on complex shapes. Additionally, optical methods conducted by the non-contact profilometer are portable and also provides correct measurements without touching the surface. However, contact and pseudo contact profilometers dominated the market in 2017. Under the dimension segment, 3D optical profilometers are preferred and are used in industries such as semiconductors and electronics due to the fact that they provide accurate results. It can measure any surface with the help of axial chromatist. With non-contact profilometers, there is no need for any sample preparation. Additionally, 3D non-contact profilometers can measure any surface such as opaque, transparent, diffusive, rough, and polished. These features of 3D non-contact profilometers are anticipated to accelerate the growth of the global profilometer market during the forecast period. Due to the large-scale demand for 3D non-contact profilometers in the semiconductor and electronics industry, demand for profilometers in these sectors is experiencing significance dominance over the years. Additionally, growth in semiconductor and electronic sectors has also resulted in the rise in usage of such instruments in these industries over the years. The market in Asia Pacific is expected to be dominant during the forecast period. China’s impact on the semiconductor industry increased in 2015. In fact, both China’s semiconductor consumption and production revenues increased at a greater rate than worldwide revenues. As a result, China’s share of the worldwide consumption market increased to 58.5% in 2016, while its share of the worldwide semiconductor industry increased to 16.2%. From 2005 through 2016, China’s semiconductor industry grew at a ten-year compounded annual growth rate (CAGR) of 18.7%. Companies are focusing on achieving long-term growth by providing value added services to customers in the profilometer market. The companies profiled in the global profilometer market report include KLA-Tencor Corporation, Mahr Federal Inc., Zygo Corporation, Solarius Development Inc., Mitutoyo America Corporation, Schaefer Technology GmbH, Tokyo Seimitsu Co., Ltd, L. S. Starrett Company, Sensofar Group, Bruker Corporation, Jenoptik AG, Teräspyörä-Steelwheel Oy, Alicona Imaging GmbH, and AMETEK. Inc.